BSNL Parisara Spandana near Bangalore International Airport. 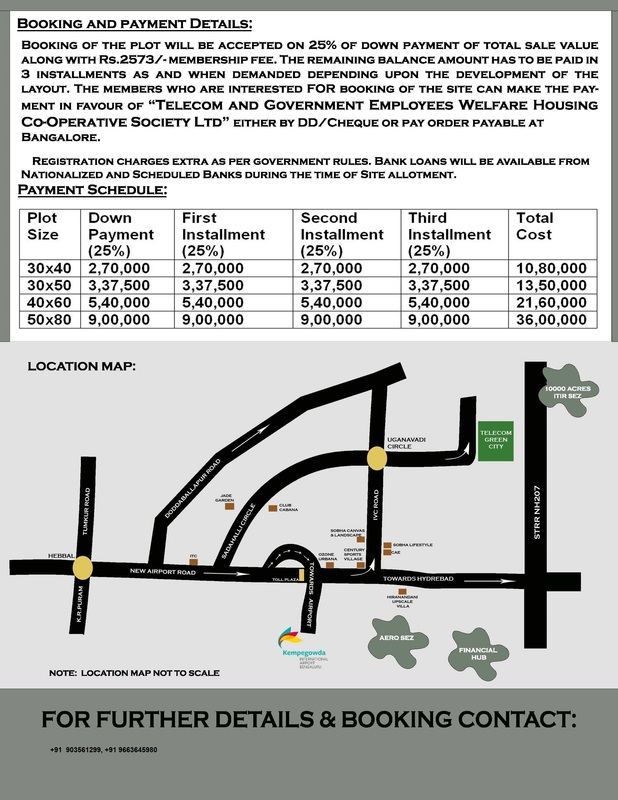 BSNL Parisara Spandana well planned residential layout at affordable price with all civic amenities. This layout is located near Cambridge Institute of Technology – North campus on the existing 45 feet road ( widening of this road to 80 feet road under progress). This project is near to North DC office . Well connected to NH 207 , IVC road and Bangalore Inernational Airport Road. 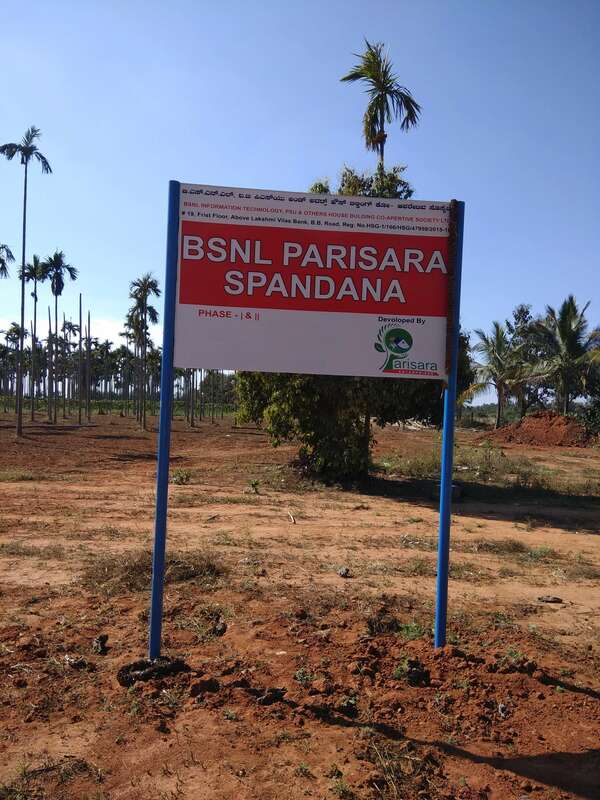 BSNL INFORMATION TECHNOLOGY, P.S.U AND OTHERS HOUSE BUILDING CO-OPERATIVE SOCIETY LTD.
BSNL PARISARA SPANDANA Inaugural Price Phase-I INR 1099/-sqft. Civic Agency Approval: BIAAPA (Bangalore International Airport Area Planning Authority) approval awaited. Booking open for General Public. Change of Usage of Land (Agriculture to Residential ) done for Phase I layout. Water and Sewage connecting to each plots. Gardens and children’s play area. Those who are interested for booking sites need to submit the application forms along 4 passport photos, ID and address proof Xerox copies with down payment amount along with membership fee Rs.2375/- in favour of BSNL Information Technology, P.S.U and Others House Building Co-Operative Society Ltd, by cheque/DD/NEFT/RTGS. WHY YOU SHOULD INVEST IN BSNL PARISARA SPANDANA, NORTH BANGALORE? The proposed 10000 acres Information Technology Investment region (ITIR) is attached to NH- 207. There are 55 MNCs including TCS, Infosys, etc has shown their interest in Information Technology Investment Region (ITIR). Aerospace, SEZ, IT and Hardware Park will occupy 3000 acres. Hardware park-850 acres and ITR Park-1156 acres. 56 large and mid-sized companies have signed up for operations in Aerospace Park. Starrag Heckert and Wipro have already initiated operation in Aerospace park and Hardware Park. Shell, Tata Elxsi and many other hardware companies will occupy space in Aerospace and Hardware Park. 200 acres University Campus of Manipal Education group. IFCI is also building 50 acres Global Financial District with the cost of Rs.1000 crores in IT park. As per government estimates 2,500,000 direct jobs will be generated by Aerospace Park only. Planned Metro Rail connectivity in Phase-2 will further improve accessibility of this region. BSNL, Central & State Govt. IT Employees & Retired Employees HBCS Ltd launched its new project Bsnl Credence on Nandi Hills Road. 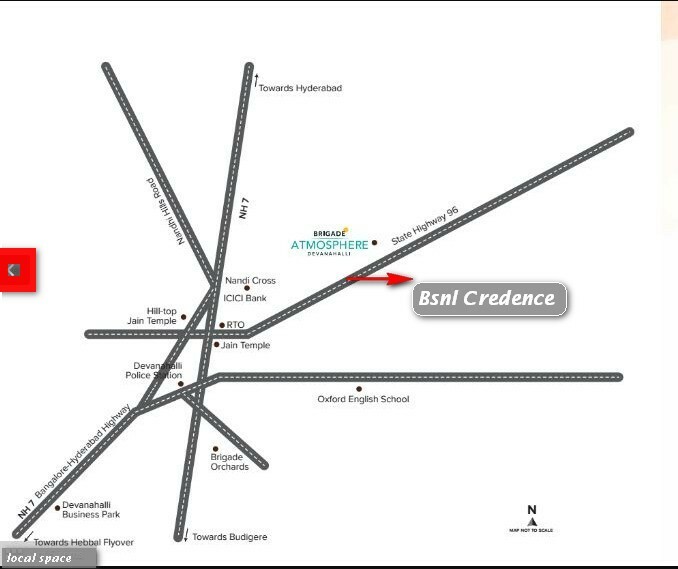 Bsnl Credence is a unique residential layout among all the House building co-operative society projects in Bangalore. INR 799 / Square feet for First 50 Applicants only!!!! Book Now!!! 1 Does this society follow National Green Tribunal norms and regulations for lake zone and storm water drains? Yes. 75 meters for lakes. 50/35/25 depending upon the category of Rajakaluve. 2 When was Housing Society set up? 3 Membership and Plot allotment is it legal for members outside the parent Department? Yes. It is legal from the year 2009. Karnataka Government has issued gazette notification on 3rd Nov 2009. 4 How many membership categories are there in Karnataka Co-operative House Building Act? under the category of Associate Membership. 5 Do they have registered office in Bangalore? Yes. Amratahalli, Airport Road Bangalore. 6 Is there any provision in Co-Operative Housing Society Act to transfer allotted plots to another Society/association? including a society registered under the Karnataka Societies Registration Act, 1960. 7 Are there any additional charges to be paid? Registration Charges extra and betterment charges as per BIAAPA norms at the time of registration. (app: 15-35/sqft). BSNL, Central & State Govt. 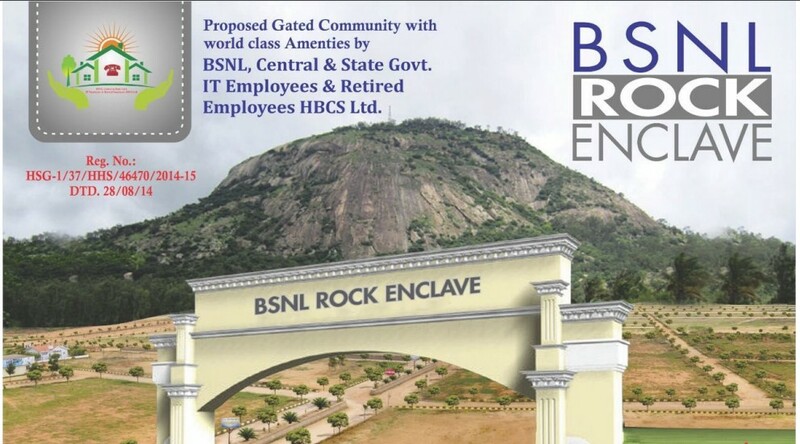 IT Employees & Retired Employees HBCS Ltd launched its new project BSNL Rock Enclave on Nandi Hills Road. BSNL Rock Enclave is a unique residential layout among all the House building co-operative society projects in Bangalore. Yes in Amratahalli, Airport Road Bangalore. 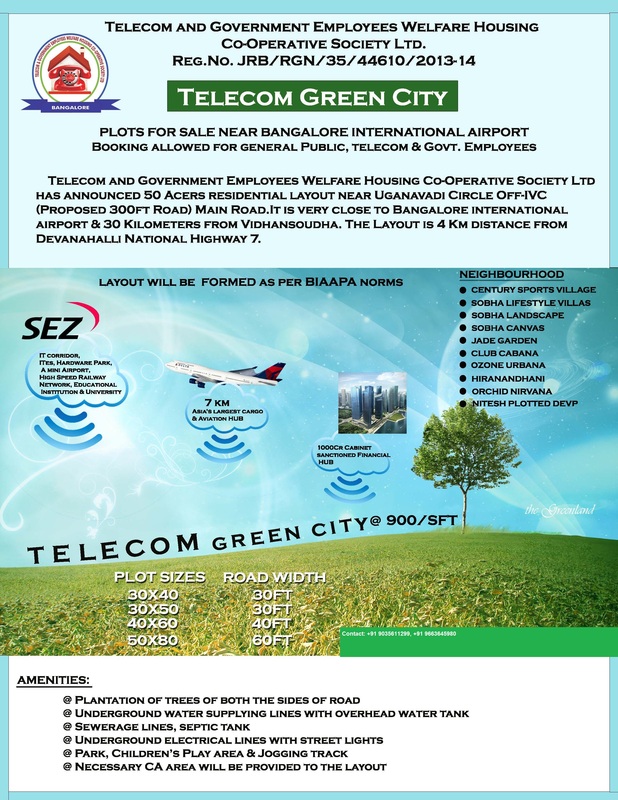 Telecom Plots-Telecom Green city IVC Road Near International Airport is located 7 kilometers from Kempe Gowda International Airport. IVC road is preferred residential zone in Bangalore North. Booking of the plot will be accepted on 25% of down payment of total sale value. The members who are interested in booking of the site can make the payment in favour of “telecom and government employees welfare housing co-operative society limited” either by did/cheque or pay order payable at Bangalore. Registration charges extra as per government rules. 1) All payment will be directly made in the name of Society and payment receipt issued by the secretary of society along with membership id. 2) Rate/Square feet the best one would get as per our Survey under installment schemes. 3) Location of this layout is excellent. Proposed 300 feet road which connects Doddaballapur road and International Airport Road. Existing 50 feet road which is maintained very well. Surrounded by many layouts like Max, Sobha etc. 4) Proposed Information Technology Investment Region(ITIR) from Karnataka State Govt in 10,000 acres of land.KIADB ha acquired around 2800 acres near Devanahalli for this purpose. This Project is located around six km from our layout. 5) Airport Cargo Village started its operation in 2009 spread over 1000 acres. 6) A cumulative investment of around INR 115000 crore worth in around this region. 7) Employment opportunity for around 2 lakhs professionals. 8) There are SEZs along with Apparel Park nearby. 9) Confirmed plot allotment in the first phase. The housing society was set up in the year 2013. The registered number is JRB/RGN/35/4460/13/14. gazette notification on 3rd Nov 2009. Contact:+91 9035611299 By :Vidyadhar Naik. Telecom Sites-Telecom Green city IVC Road Near International Airport is located 7 kilometers from Kempe Gowda International Airport. IVC road is preferred residential zone in Bangalore North.